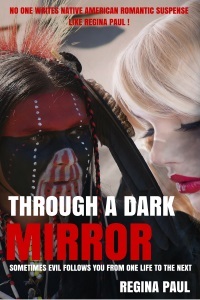 Speculative Romance Author Regina Paul: Sneak Peek: Through a Dark Mirror by Regina Paul... #ebook #romance #fiction 404 ~ Page Not Found! I love writing books that have Native American heroes and heroines. Most of you that have read my books know this already because it doesn't matter what the genre is 9 times out of 10 there's going to be a Native American main character. This is especially true with my Native American Paranormal Romantic Suspense Through a Dark Mirror. The hero is what my husband would call a "common Indian" meaning this is not someone with any particular special gifts or powers. And the heroine is a caucasian woman who has a past life as a Lakota medicine woman. Here's a bit of a sneak peek! Summer Thompson grew up around Native Americans. She has great respect for Native American peoples and traditions. Because of that respect she has made it a point in her work as an antiques dealer to purchase and return sacred objects back to the tribes they came from when she finds them. Hawk Kills Pretty Enemy, a successful Lakota business owner makes it a point of driving around in his tow truck looking for stranded drivers. He figures he has hit the jackpot with the pretty blonde behind the wheel of the Mercedes Benz sitting on the side of the road. When he discovers that she is the Summer Thompson that has returned so many sacred objects and artifacts back to the People, he is even more happy to help. But it does not take long in Summer’s presence for Hawk to begin to suspect that Summer may be someone he has been searching for his whole life. But when an artifact of great power comes into Summer’s possession, and an ancient evil returns, will Summer remember what she needs to in time to save the man she is coming to love? And here's the short excerpt and sneak peak! The glow from her bedside lamp spilled into the living area, casting shadows on the walls and windows. Her eyes glanced over to the bay windows in the south of the room. A chill raced up her spine when for a second, an image seemed to appear in the glass, and it was not a pleasant one. Whatever it was seemed to be nothing more than skin hanging off of a skeleton and glowing red eyes. Summer put one hand to her throat, backing up. It can’t be real! she thought. The figure almost seemed to loom from the glass and enter the room. Her throat closed on a scream, but then she blinked, and the image disappeared. She sprinted to the different light switches around the room and turned them all on before she felt like she could walk up to the glass and look out. Nothing. The parking lot beneath her two-story apartment and shop was empty, but well lit as usual. No one was walking around, and her Benz appeared unharmed by the illusion she’d seen. The vision on top of the dream and the strange phone call had rattled her. What does it all mean, if anything? Were the incidences even related? For the first time, she was uncomfortable and didn’t feel safe in her own home. Summer wrapped herself up in a hug, for once wishing that she didn’t live alone. (c) Copyright 2015 by Regina Paul. All Rights Reserved.